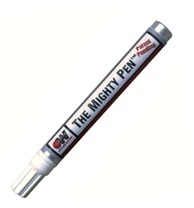 CircuitWorks Mightly Pen is the powerful cleaning pen for all technicians.  This marker dispenser provides controlled and exact application with outstanding cleaning abilities.  Use for general purpose cleaning and refurbishing of equipment.  Removes ink stains, label adhesives and difficult to remove soils.  Size: 11 gram pen.